Having recently survived a cross-country move the topic of building versus buying has been top of mind. A certain large (blue and yellow) furniture retailer has made a small fortune off of my family's moves over the years. But with their lower cost furniture comes limited choices for customization, as well as untold hours spent inventorying screws and nuts and deciphering cryptic pictograms. Is all that DIY really saving us money? Does it need to be unique or special? In other words, does that mahogany bookcase need to be adorned with the Rimmer family crest? Or does it need to pivot into the secret room behind the bookcase? Is it something that will have a lot of visibility or repeated use over time? No one is going to enjoy sitting on wobbly chairs. Making a substantial one-time investment in high-quality chairs might save us some money and embarrassment in the long run. But then again, no one sits in the formal dining room so maybe that money is better spent elsewhere. How quickly do we need it? Do we need a new sofa right away or can we afford to wait while we work with a designer to customize something that we’ll enjoy for years to come? How often will we need or want an update? Historically, we've moved every 5 to 7 years and ditched all of our furniture along the way. Do we have the money to get what we really need? Maybe we should shift some budget around to get the custom-built dining room table that will actually be long enough to seat everyone for dinner and wide enough to hold all the board games on family game night? Interestingly enough, I’ve found a set of very similar questions can be applied to decisions about whether to build, buy, or customize off-the-shelf e-learning. Has someone already built this course, or is it something we need tailor-made just for us? Is it very high risk, important (i.e., has a crucial business impact), or does it have a lot of visibility to your organization? Or is it mandatory compliance training that’s more check the box? Will the course need to be updated regularly? Do we have budget and resources to build the right solution in-house or with outside expertise? Gathering the answers to these questions starts by understanding the needs of your audience and your organization, which is the foundation of a robust Needs Analysis. Nicole Legault has beautifully summarized this step of the design process in the article: How to Do an E-Learning Needs Analysis. But once you’re clear on the needs, goals, priorities, and resources, try to do what my husband and I did and broaden your thinking from focusing solely on cost to focusing more on how you and your team can deliver the best value. To help make this a little easier, I’ve built a very simple decision-making tool in Storyline 2. This tool is loosely based on a “Buy versus Build” flowchart developed by Laura Francis for Learning Circuits, which was featured in Jane Bozarth’s Nuts & Bolts column in Learning Solutions Magazine in March, 2012. I’ve referred to Jane’s article and Laura’s flowchart several times over the years (both are excellent resources), so I’m hoping my techie spin on these decision points will be something you’ll find helpful, too! 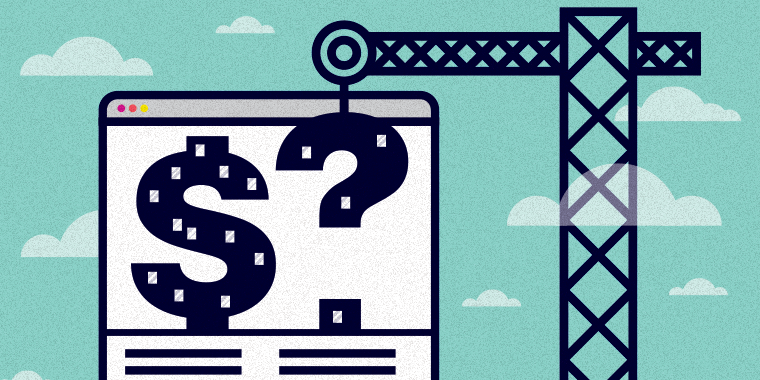 What questions do you ask when you’re considering whether to buy or build e-learning? Share your tips and advice with the community by leaving a comment below. Looking for even more tips? Follow us on Twitter and come back to E-Learning Heroes regularly for more helpful advice on everything related to e-learning. Lol, I have this Q&A at the start of every first project meeting. Good analogy! Great article Trina! I would really like to see this bookcase of yours.